I got the weekend to myself, and had a perfectly luxurious time. I ran a few errands, cleaned up stuff on my computer, did some reading, and reaquainted myself with some old friends from Stars Hollow. Now, those of you who know me know of my former major obsession love of the Gilmores. And you also know of my disenchantment, anger, broken heart, and temporary break-up with Gilmore during its final season. I eventually caved and finished out the season, but since the show ended, I’ve only watched a handful of episodes. I don’t know if it was the nice weather, the resurgence of Lauren Graham on my TV again, the fact I had a weekend to myself, or my rediscovery of this* coupled with my rediscovery of a Lorelai mix I made three years ago, but I found myself jonesing for some Gilmore all week long. For me, Gilmore has always been a comfort. (Except when it wasn’t, but we don’t like to talk about that time.) It’s the TV-equivalent of pot roast and chocolate pie. And even though it’s been years, and things have changed, and I have changed, when I put in my season 2 DVD and started watching, it was as though I never stopped. I was back in my apartment in Chicago, watching my illegally-burnt copy of A Film By Kirk, pausing it to go get my roommate, because Sean Gunn dancing was something he had to see. I decided to watch episodes I often skip over. I’ve seen Rory’s First Kiss and Last Week Fights, This Week Tights too many times to remember, but what about those hidden gems in seasons 2 and 3? I always gloss over seasons 2 and 3, in favor of season 4 (the ultimate season) and season 5 (because Luke and Lorelai are FINALLY together). So this weekend, I rediscovered hidden gems like Lost and Found, where Luke looks for a new apartment, and Dear Emily and Richard, which is both hilarious and heartbreaking at the same time. I watched Paris melt down on C-Span in The Big One and Emily battle it out with the original Lorelai in That’ll Do, Pig. These are episodes no one really thinks about, because they are episodes that don’t advance the plot much. Not a lot happens in these episodes, and yet everything happens. So that’s how I spent my weekend. Should I have gone outside more? Perhaps. But I’m happy with my decision. I got reacquainted with an old friend, and remembered what made me love the show in the first place. I rediscovered the awesomeness of high school Rory, Lauren Graham’s amazing hair and beautiful eyes, and that Luke, was, on many occasions, a very funny man. Now. The only problem with this is that…as many of you know…I had a…*slight* problem with Gilmore. As in, you know, some might say, a wee bit of an addiction. 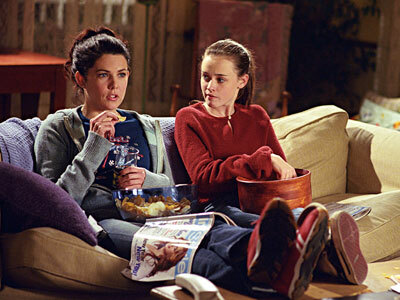 So my goal this week is to not spend it with my head halfway in Stars Hollow. I need to be in the real world. I think I can do it. I know I can do it. Because, even though I remember the girl who spent her nights locked in her tiny room in Chicago, watching those bootlegged DVDs, I am not that girl anymore. Really. I swear. I can stop any time I want to. Gilmore doesn’t control me, I control when and where Gilmore watching takes place. Seriously. Wait, stop. Don’t take the DVDs away from me. I can handle it! Where are you going? Stop! This entry was posted in Classic TV Clips, People I want to befriend, tv by Sarah. Bookmark the permalink.